Not strictly a Worthing pub, but close enough. 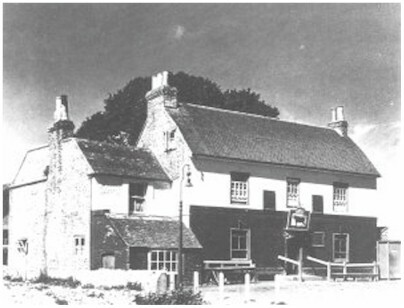 Thought to date back to around 1770 and called the Bulls Head Inn, the name was changed to the Bull in 1904. The pub has been used more than once as a mortuary as the building had particularly thick walls. The extension was built in 1888 and may have been used as a butchers shop for a while. Unusually it was never a coaching inn. The outside remains identical today. 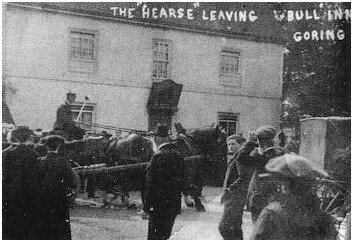 The funeral of Sidney Orchard & Frederick Wadey leaving the Bull Inn in June 1907. Both young men, 19 and 22 respectively, had been killed by a bolt of lightening whilst sheltering under a tree near the entrance to Highdown Towers during a storm. It has been said that the copper coins in one of their pockets had been fused together by the intense heat. Two other men with them survived with minor injuries. They were buried in Goring Churchyard. 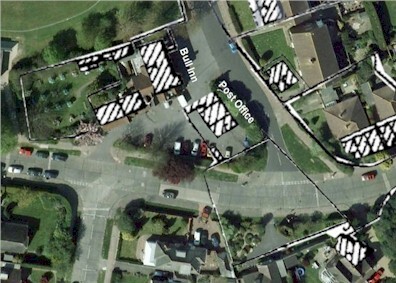 Using a map overlay from 1899, we can see that the post office used to be in what is now the car park of the present property. We note also that the property boundary to the west and north of the pub, remains almost identical to that of the earlier period. However, almost all of the other buildings have been replaced. The Bull', now 'The Bullshead'. Around the turn of the 19th/20th Century, it was Mr and Mrs Cornford. The Cornford's daughter, Ethel remained a spinster all her life and ran a small grocery store on Goring Road almost until her death c. 1969. Before Roy and Edwina Sanders took over 'The Bull' in 1967, John and Mary Thomas ran the pub for many years - I cannot be certain what year they arrived but a few remaining locals will have a better idea, I think it may have been just after the end of the Second World War. I remember them being there.